Join us on one of our ‘once in a lifetime’ whale watch tours and you may get the opportunity to swim with the amazing Humpback whale. Often stated as a ‘Life Changing’ experience, for many swimming and interacting with a whale has been a life long dream. Let us help deliver that dream. We can help you plan your trip or tour as much or as little as you would like. We have a wealth of Local Knowledge all freely offered. 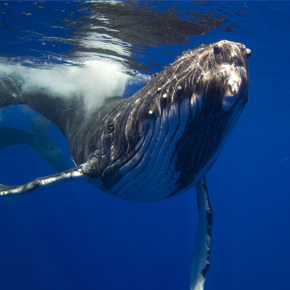 Humpback Whales will be in Vava’u between July and October and we will be running daily trips throughout that time. Except Sundays. All kinds of Humpback activity will be seen during this time as the whales mate and give birth and interact in their natural environment. When conditions are right and the whales comfortable with our presence we will get you swimming with these majestic creatures. Truly a unique experience and one never forgotten. 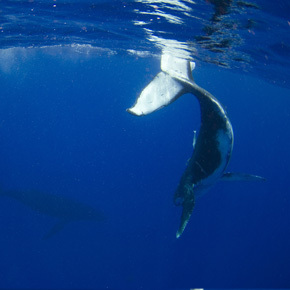 Click here to find out more information about Swimming with Humpback Whales. After 2 years of planning, we finally got to experience the thrill of a lifetime. Can't praise the staff and crew of Dolphin Pacific highly enough. Their professional, personable approach and understanding of the whales and their behaviour exceeded our expectations on all levels.